“Abu Bakr Al-Iraqi” is an ISIS propagandist on Twitter. He posts updates on ISIS activities and links to YouTube clips highlighting ISIS advances.Abu Bakr al-Iraqi, Twitter post, July 10, 2015, 10:08 a.m., https://twitter.com/PachaAbuirhabi/status/619508459873116160. On March 22, 2016, al-Iraqi posted praise on Twitter and Telegram for the attacks in Brussels’s airport and subway that killed at least 34 people that day. He also posted quotations from the late Muslim Brotherhood ideologue and Islamist inspiration Sayyid Qutb to his Tumblr account.Abu Bakr al-Iraqi, Tumblr post, March 22, 2016, http://abu-bakr-alansari.tumblr.com/post/141482915601/and-fight-against-the-disbelievers-collectively. Whether al-Iraqi continues to reside in Brussels or if he was connected to the attacks beyond merely providing praise is unknown. On the day of the attacks, another Twitter propagandist, EPIC, posted a tweet asking for prayers for Milk Sheikh and referencing a tweet that has since been removed.EPIC, Twitter, March 22, 2016, 6:27 a.m., https://twitter.com/EPlC24/status/712224203714342913. Al-Iraqi also frequently posted about the sanctity of marriage, and lamented high divorce rates. He calls divorce “the most hated halal [permissible] action in the sight of Allah.”Abu Bakr al-Iraqi, Twitter post, July 10, 2015, 7:52 a.m., https://twitter.com/PachaAbuirhabi/status/619474267818700800. Among the other ISIS propagandists al-Iraqi retweets, he has reposted several tweets from Abu al-Qacem Sfaxian, a Twitter user who claims to be in Tunisia and on his 44th account.Abu al-QacemSfaxian, Twitter, accessed July 14, 2015, https://twitter.com/Qacem_Tbarqa_44. The retweets include links to and analysis of Dabiq, ISIS’s English-language magazine. 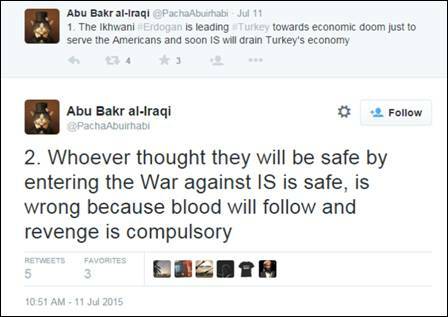 On July 11, 2015, he tweeted “blood will follow and revenge is compulsory” against all who make war against ISIS.Abu Bakr al-Iraqi, Twitter post, July 9, 2015, 10:51 a.m., https://twitter.com/PachaAbuirhabi/status/619881687107915776. A day after the July 10, 2015, bombing outside the Italian embassy in Cairo that killed at least one person,“Bomb outside Italian embassy in Cairo leaves at least one dead,” Guardian (London), July 11, 2015, http://www.theguardian.com/world/2015/jul/11/huge-car-bomb-outside-italian-embassy-in-cairo. al-Iraqi called the explosion “a blessed operation.”Abu Bakr al-Iraqi, Twitter post, July 11, 2015, 12:16 a.m., https://twitter.com/PachaAbuirhabi/status/619903197356912640. Al-Iraqi also believes the growing oppression of Egyptian President Abdel Fata el-Sisi provides ISIS with “fertile ground” to “expand and win hearts & minds.”Abu Bakr al-Iraqi, Twitter post, July 11, 2015, 12:46 p.m., https://twitter.com/PachaAbuirhabi/status/619903197356912640. Al-Iraqi tweeted that Turkey’s decision to join the fight against ISIS will result in the destruction of its economy and elimination of its leaders.Abu Bakr al-Iraqi, Twitter post, July 9, 2015, 10:52 a.m., https://twitter.com/PachaAbuirhabi/status/619882022308327424. ISIS will “drain Turkey’s economy,” according to a July 11 tweet blaming Turkish President Recep Tayyip Erdogan for leading his country to “economic doom.”Abu Bakr al-Iraqi, Twitter post, July 11, 2015, 10:49 a.m., entry to the war against IS will destroy its economy &eliminate its leaders by the permission Allah.” https://twitter.com/PachaAbuirhabi/status/619881235029061632. Al-Iraqi refers to moderate Muslims by the derogatory term “coconuts,” and he considers them closed off to knowledge.Abu Bakr al-Iraqi, Twitter post, July 11, 2015, 10:16 a.m., https://twitter.com/PachaAbuirhabi/status/619872797138001920.He also refers to them as “Munafiqeen,” an Arabic term for hypocrites who outwardly practice Islam but internally question it. He blames the “Munafiqeen” for acting against Islamic interests. It appears al-Iraqi considers any Muslim not actively siding with ISIS to be part of the munafiqeen, including the Muslim Brotherhood, which he casts as apostates. @abubakrmuwahidAbu Bakr al-Iraqi, Twitter page, accessed September 2, 2015, https://twitter.com/abubakrmuwahid. @absialbaghdadiAbu Bakr al-Iraqi, Twitter, accessed December 8, 2015, https://twitter.com/absialbaghdadi. @MilkSheikh2Abu Bakr al-Iraqi Twitter page, accessed March 22, 2016, https://twitter.com/MilkSheikh2. @PachaAbuirhabiAbu Bakr al-Iraqi, Twitter, accessed July 14, 2015, https://twitter.com/PachaAbuirhabi. @pachaboilerAbu Bakr al-Iraqi, Twitter page, accessed September 10, 2015, https://twitter.com/pachaboiler. @pachachefAbu Bakr al-Iraqi, Twitter page, accessed September 18, 2015, https://twitter.com/Pachachef. @pachahackerAbu Bakr al Iraqi, Twitter page, accessed August 28, 2015, https://twitter.com/pachahacker. @pachaserverAbu Bakr al-Iraqi, Twitter page, accessed July 30, 2015, https://twitter.com/pachaserver. @PachaspicesAbu Bakr al-Iraqi, Twitter, accessed October 26, 2015, https://twitter.com/pachaspices. @Pasha_al_IraqiAbu Bakr al-Iraqi, Twitter page, accessed March 24, 2016, https://twitter.com/Pasha_al_Iraqi. @Pashabakr1Abu Bakr al-Iraqi, Twitter, accessed November 19, 2015, https://twitter.com/Pashabakr1. Abu Absi al-YemeniAbu Bakr al-Iraqi, Twitter, accessed December 9, 2015, https://twitter.com/absialbaghdadi. Abu-Bakr-alansariAbu Bakr al-Iraqi, Tumblr account, accessed March 22, 2016, http://abu-bakr-alansari.tumblr.com/. Milk SheikhAbu Bakr al-Iraqi Twitter page, accessed March 22, 2016, https://twitter.com/MilkSheikh2. 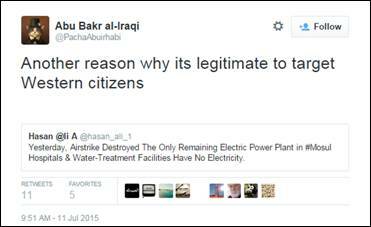 “Abu Bakr Al-Iraqi” is an ISIS propagandist on Twitter. “Today is a happy day for the believers!” (Tweet)Abu Bakr al-Iraqi, Twitter post, March 22, 2016, 8:45 a.m., https://twitter.com/MilkSheikh2/status/712258993687814144. “[T]he Positive consequences of #brusselsattack is that Belgium will carry out mass arrests, which will lead to further recruitment for IS” (Tweet)Abu Bakr al-Iraqi, Twitter post, March 22, 2016, 8:16 a.m., https://twitter.com/MilkSheikh2/status/712251722358509569. Abu Bakr al-Iraqi, Twitter post, March 22, 2016, 6:18 a.m., https://twitter.com/MilkSheikh2/status/712222032671469568. “If the Mule of Jews #Obama didn't announce Sh. Osama Bin Ladin's death, then you would hear Zawahiri now speaking about Bay'ah to OBL” (Tweet)Abu Bakr al-Iraqi, Twitter post, November 7, 2015, 11:29 a.m., https://twitter.com/pachaspices/status/663030586630520832. “Every group that pledge allegiance to IS outside of Iraq & Syria flourish. Look at Wilayat Gharb Ifriqiya & Wilayat Sinai” (Tweet)Abu Bakr al-Iraqi, Twitter post, November 7, 2015, 11:52 p.m., https://twitter.com/pachaspices/status/663217445071491077. “IS will grow as long as there is injustice & oppression around.” (Tweet)Abu Bakr al-Iraqi, Twitter post, October 8, 2015, 12:35 a.m., https://twitter.com/Pachachef/status/651979252527726592. “Never in history have all sects, heretics apostates & Munafiqeen gathered against the Ummah like they do against #Syia & #Iraq” (Tweet)Abu Bakr al-Iraqi, Twitter post, August 3, 2015, 11:07 p.m., https://twitter.com/pachaserver/status/628401846370045952. “When IS hits Tehran, you'll see donkey’s who will condemn it and scream that IS corrupted the ‘Jihad’ of Ahwaziz”Abu Bakr al-Iraqi, Twitter post, July 14, 2015, 10:38 a.m., https://twitter.com/PachaAbuirhabi/status/620965537997266944. 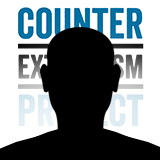 “After investing so much money in it, the new #UAE, #US project to counter IS online is already failing https://twitter.com/sawabcenter ”Abu Bakr al-Iraqi, Twitter post, July 13, 2015, 1:13 p.m., https://twitter.com/PachaAbuirhabi/status/620642148103229441. 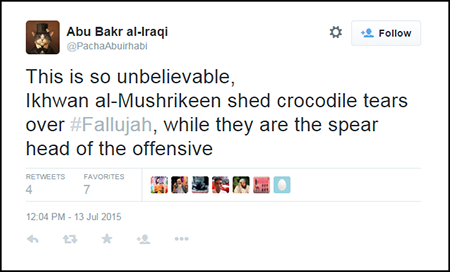 “This is so unbelievable, Ikhwan al-Mushrikeen shed crocodile tears over #Fallujah, while they are the spear head of the offensive”Abu Bakr al-Iraqi, Twitter post, July 13, 2015, 12:04 p.m., https://twitter.com/PachaAbuirhabi/status/620624760641171456. “1. Brothers &Sisters, i hate to bring bad news, but a big conspiracy will occur in the near future against the Muslims in Sham & Iraq”Abu Bakr al-Iraqi, Twitter post, July 12, 2015, 5:19 p.m., https://twitter.com/PachaAbuirhabi/status/620341751769726976. “2. The appearance of Zahran Alloush 4 days ago and threatening to invade #Raqqa, and Ahrar al-Sham message to US Administration.”Abu Bakr al-Iraqi, Twitter post, July 12, 2015, 5:20 p.m., https://twitter.com/PachaAbuirhabi/status/620342112945467392. “3. Indicates that its something that wasn't planned over a night.”Abu Bakr al-Iraqi, Twitter post, July 12, 2015, 5:23 p.m., https://twitter.com/PachaAbuirhabi/status/620342634020638720. “4. The sudden Turkish-Qatari-Saudi alliance, and Turkish plan of invading IS territories in favor of Jaysh al-Fateh under the pretext”Abu Bakr al-Iraqi, Twitter post, July 12, 2015, 5:25 p.m., https://twitter.com/PachaAbuirhabi/status/620343193989558272. “5. of creating ‘Safe zone’, the crackdown on Monotheist in Turkey. Ikhwani tour to Mosques in the West with their anti-IS lectures”Abu Bakr al-Iraqi, Twitter post, July 12, 2015, 5:26 p.m., https://twitter.com/PachaAbuirhabi/status/620343578456256513. “6. UAE starting anti-IS channel, Hamas long term truce with Israel etc. it is as Sh. Anwar al-Awlaki predicted”Abu Bakr al-Iraqi, Twitter post, July 12, 2015, 5:27 p.m., https://twitter.com/PachaAbuirhabi/status/620343843192320000. “Another reason why its legitimate to target Western citizens”Abu Bakr al-Iraqi, Twitter post, July 11, 2015, 9:51 a.m., https://twitter.com/PachaAbuirhabi/status/619866660372094977. “According to Sharia & even reality Western Journalist have always been part of the Propaganda machine”Abu Bakr al-Iraqi, Twitter post, July 11, 2015, 9:52 a.m., https://twitter.com/PachaAbuirhabi/status/619866905210433536. “1. The new method of of Western journalist is to interview Muslims citizins in Shia prison at portray them as "Captured" IS fighters”Abu Bakr al-Iraqi, Twitter post, July 11, 2015, 9:58 a.m., https://twitter.com/PachaAbuirhabi/status/619868444553555968. “#PT: Lesson learned who is isn't with us (Any Muslim group fighting for Sharia) is with the disbelievers, so instead of getting angry (...)”Abu Bakr al-Iraqi, Twitter post, July 11, 2015, 10:10 a.m., https://twitter.com/PachaAbuirhabi/status/619871423562141696. “#PT: (...9 Why not use force against those hypocrites? in the end they get Salary from the kuffar to spread Nifaq & misguidance”Abu Bakr al-Iraqi, Twitter post, July 11, 2015, 10:11 a.m., https://twitter.com/PachaAbuirhabi/status/619871576461320192. “Everytime Muslims rose against oppression or to liberate the occupied land, the Munafiqeen were in the front row to propagate against them”Abu Bakr al-Iraqi, Twitter post, July 11, 2015, 10:17 a.m., https://twitter.com/PachaAbuirhabi/status/619873122213306368. “And there are some people who still doubt the apostasy of ‘Muslim’ Brotherhood leaders .....”Abu Bakr al-Iraqi, Twitter post, July 11, 2015, 10:22 a.m., https://twitter.com/PachaAbuirhabi/status/619874332777553921. “1.The Ikhwani #Erdogan is leading #Turkey towards economic doom just to serve the Americans and soon IS will drain Turkey’s economy”Abu Bakr al-Iraqi, Twitter post, July 11, 2015, 10:49 a.m., https://twitter.com/PachaAbuirhabi/status/619881235029061632. “2. Whoever thought they will be safe by entering the War against IS is safe, is wrong because blood will follow and revenge is compulsory”Abu Bakr al-Iraqi, Twitter post, July 9, 2015, 10:51 a.m., https://twitter.com/PachaAbuirhabi/status/619881687107915776. “3. #Turkey’s entry to the war against IS will destroy its economy &eliminate its leaders by the permission Allah.”Abu Bakr al-Iraqi, Twitter post, July 9, 2015, 10:52 a.m., https://twitter.com/PachaAbuirhabi/status/619882022308327424. “After the blessed operation at the Italian Embassy in #Cairo, #Aljazeera, Ikwhan al-mushrikeen & Munafiqeen pretended that nothing happened”Abu Bakr al-Iraqi, Twitter post, July 11, 2015, 12:16 a.m., https://twitter.com/PachaAbuirhabi/status/619903197356912640. “Consequences of #Egypt attack will be more oppression from #Sisi Gov., which is fertile ground from IS POV to expand and win hearts & minds”Abu Bakr al-Iraqi, Twitter post, July 11, 2015, 12:46 p.m., https://twitter.com/PachaAbuirhabi/status/619903197356912640. “If you reject any Sunnah of the prophet&Quran you have committed apostasy This is something for sisters who hate to be‘Second wives’ in Sham”Abu Bakr al-Iraqi, Twitter post, July 11, 2015, 10:01 p.m., https://twitter.com/PachaAbuirhabi/status/620050273457819649. “IS need to focus heaveliy on recruiting former military officers rather than taking Bay'ah from Notorious tribes”Abu Bakr al-Iraqi, Twitter post, July 10, 2015, 3:15 a.m., https://twitter.com/PachaAbuirhabi/status/619404553004425216. “Spread the word that i'm back so that i can found all favorite tweeps ^_^”Abu Bakr al-Iraqi, Twitter post, July 10, 2015, 4:21 a.m., https://twitter.com/PachaAbuirhabi/status/619421227577257984. “Working with the US against Muslims, Fund Sahwat, Want to invade Muslim lands and Naive souls get angry when we call Erdogan for apostate”Abu Bakr al-Iraqi, Twitter post, July 10, 2015, 9:08 a.m., https://twitter.com/PachaAbuirhabi/status/619493271732154368. “Remember how many times #Baiji have been “Liberated” by Western media? And may i ask, liberated from what? it's people?”Abu Bakr al-Iraqi, Twitter post, July 10, 2015, 10:15 a.m., https://twitter.com/PachaAbuirhabi/status/619510154816548864. “My thoughts goes to the sisters with Nationalistic parents who are like a Sahwa checkpoint which hinders them from marriage”Abu Bakr al-Iraqi, Twitter post, July 10, 2015, 5:59 p.m., https://twitter.com/PachaAbuirhabi/status/619626916228808706. “Terrorizing you is my game, and implementing Sharia is my aim ....”Abu Bakr al-Iraqi, Twitter, accessed July 14, 2015, https://twitter.com/PachaAbuirhabi.